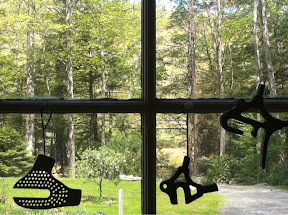 3 interesting dropouts hanging in the window at Peter Weigle’s shop. One is a super drilled out track dropout, one appears to be a French vertical dropout, and one is a British dual dropout- it can either be used as a vertical dropout when used with a derailleur or horizontal dropout when used as a single speed. I believe it was manufactured by Cyclo and was found on British bikes in the 1950s.